Solve most sound transmission issues in Fitness centers. This product is recommended for High Rise Condominiuns, with free-weight areas. Accousti Tile, is one of the thickest products in the industry. This product helps reduce sound transmission to apartments, spa, and other noise sensitive areas. Sound testing reports available upon request. Designed with a patented wear layer to provide unlimited design options, U-Tile offers a new brand of visual excitement to any club interior. 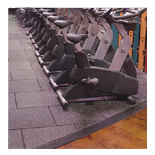 Available in 12 standard designs, U-Tile colors coordinate with fitness equipment as well as other flooring options. 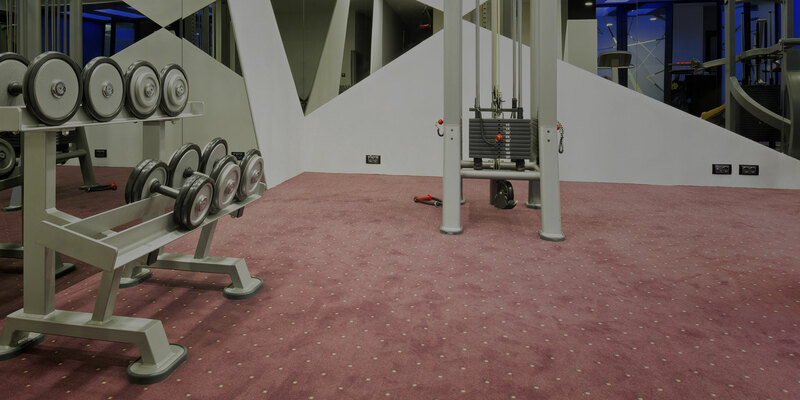 This product is recommended for High Rise Condominiums, CrossFit Centers, Olympic Platforms, Colleges & Universities, with free-weight areas. This prodhelps reduce sound transmission to apartments, spas, and other noise sensitive areas. Another plus to this product, not only are they good looking tiles, but they have a pedestal underside, preventing unsightly cable clutter by routing fitness equipment wiring beneath the surface. They are easier and faster to install than traditional glue down floors because no adhesive is needed. Plus its unique dowel rod fastening system gives you the ability to quickly move or replace tiles as desired. They are easier and faster to install than traditional glue down floors because no adhesive is needed. Plus its unique dowel rod fastening system gives you the ability to quickly move or replace tiles as desired.